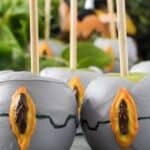 These Mecha’thun candy apples are easy to make and fun for any Hearthstone party! Inspired by the new C’thun look, these are a tasty treat! Remove the stems from the apples then wash and dry them thoroughly. You don’t want any water on them. Stick your skewers through the apple where the stem was. Push them through until they are about half way. In a microwave safe bowl, combine your white and black candy melts. Microwave for 30 seconds, stir and repeat until the chocolate is melted and mixed so you have a nice grey color. If the chocolate seems too thick (which it probably will), stir in 1tbs of coconut oil. Add more coconut oil if it needs it, until you get a good dipping consistency. Dip your apples in the grey chocolate, coating all sides. I like to spin the apple using the skewer while it is in the chocolate and typically hold the bowl and apple at a light angle to get the chocolate up the sides of the apple. Remove the apple from the chocolate and place on the parchment paper, skewer sticking up. If the chocolate seems to be cracking or sliding off, try holding the apple by the skewer as if you were going to eat it for 20-30 seconds before setting it on the parchment paper to dry completely. This allows the chocolate to set up a little, allowing gravity to pull it in one way before being set upside down and having gravity pull it the other way. Let the chocolate dry completely, 30-40 minutes or longer. Once the chocolate is completely dry, microwave the yellow chocolate candy melts like you did the white and black candy melts. Add a tsp of coconut oil, and stir completely. Pipe the yellow candy melt on each apple in the shape of an eye. Allow to dry completely. Should take only 10 minutes or so. Melt your chocolate chips in the microwave and pipe inside the eye creating the pupil. Using your orange food gel, paint a think border on the yellow candy. Then using your black food gel, paint on the line that goes around the apple, starting at the eye and working your way to the back. I like to do half from one side of the eye and half from the other, so at least lines start out level.